Dice Masters Faerûn Under Siege Collector's Box allows players to collect and assemble their “party” of character dice and battle in head-to-head game play. Dice Masters brings Collectible Dice Building to the tabletop with this all-new head-to-head competitive game set in the Dungeons & Dragons Forgotten Realms® universe! Dice Masters is a global hit from WizKids. It uses the same proprietary Dice Building Game platform developed by Michael Elliott and Eric M. Lang. Dice Masters Faerûn Under Siege takes epic dice battles to new heights! 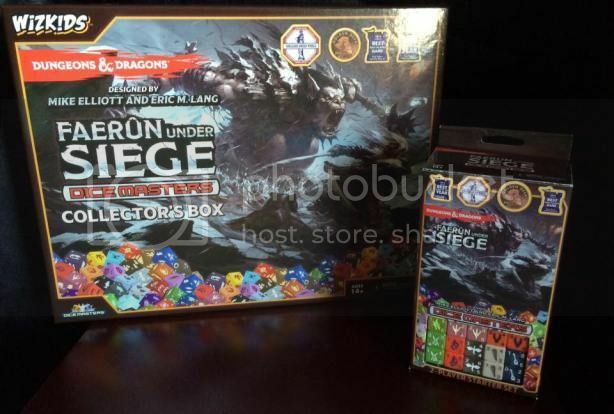 The Dice Masters Faerûn Under Siege Collector’s Box has everything one player needs to get started playing Dice Masters! Each Dice Masters Faerûn Under Siege Collector’s Box contains 8 Sidekick Dice, 12 Basic Action Dice, a full art promo card, 10 Basic Action Cards, 1 Premium Dice Bag and 2 dice storage trays that hold over 300 dice! Let’s take a look at all the new abilities in this set. When a character die with Breath Weapon X attacks and uses it’s Breath Weapon ability, you may pay X energy to prevent that damage. We saw the introduction of the Breath Weapon in Battle for Faerûn. Now we have it’s counter, the Anti-Breath Weapon! Breath Weapons are useful and many players have found ways to integrate a Breath Weapon onto their teams. We’ll have to see how these new characters with Anti-Breath Weapon will work themselves onto teams. There isn’t anything overly complicated about using Anti-Breath Weapon. If your opponent attacks and uses a Breath Weapon, you just pay the same amount of energy and you prevent the damage. We assume this means all the damage, to characters and player, and we’re going with that until we hear otherwise. If a die with Cleave attacks and KOs a blocking character die with combat damage, they deal half of their A (rounded down) to another character die your opponent controls as combat damage (only once). Holy hand-axes Batman! You could easily pair a character with Cleave with Goblin Attack Force, Goblin Squad and use the Global to force your opponent to block, pump up the Cleave character’s attack with a Global like the one on Anger Issues or Invulnerability, and easily wreck some face. You could even throw in some Overcrush for some salt in that wound. This ability looks like it’s going to be fun to play around with. When you use a Global like the one on Anger Issues or Invulnerability, you want to do it before you attack. That’s so you can hit another character with Cleave for more damage and hopefully KO it too. This ability gives me goosebumps and chills! I can’t wait to try it on a team! Characters with Fabricate will have two numbers (X-Y). If you KO X characters with total purchase cost Y or more, you can purchase the die with Fabricate X-Y for free. This is an interesting ability that gives you a different option for purchasing characters. Let’s say you have a character with Fabricate 2-3 and you have three characters in the field. Character A has a purchase cost 1, Character B has a purchase cost of 2, and Character C has a purchase cost of 4. If you wanted to purchase your Fabricate 2-3 for free, you would be required to KO a minimum of two characters and their purchase cost (added together) would need to total three or more. You could KO Character A and B, Character A and C, or Character B and C. You could not KO only Character C and purchase your Fabricate 2-3 character because it requires you to KO two characters. If you were to use characters that had KO abilities or even some ‘when fielded’ abilities, you could benefit a great deal from using Fabricate. Characters with Fast deal combat damage before other characters, all at the same time, instead of at the regular time for combat damage. This has got to be one of my favorite new abilities. I love having the chance to deal damage before other characters and this could even be a game winning move! Let’s say I have two Sidekicks and a Potion, Paragon Spell in my Reserve Pool, and my opponent has Nova, The Human Rocket. Both my life total and my opponent’s life total are at one. I attack with both my Sidekicks and my opponent blocks one Sidekick with their Nova and leaves the other Sidekick unblocked. Normally this would result in a tie because of Nova’s ability, but if I give the unblocked Sidekick the Fast ability with my Potion, I would win because that Sidekick would deal his damage before the other characters. This ability is also extremely useful for characters that have a high attack and a low defense, like Ant-Man, Biophysicist. If a character with a defense equal to or less than Ant-Man’s attack were to block him (or be blocked by him) while he had Fast, he would KO that character before it has a chance to deal it’s damage back. If you field a die with Gate Balor, you could take an unpurchased Balor die from one of your cards and roll it. On a character face, you can place the unpurchased die into your Prep Area. Sometimes a die can Gate in a different type of die (like a fiend). In that case, you may select any qualifying die. This ability may seem difficult or confusing at first, but it really isn’t hard to use. It’s a great alternative to having to purchase every die of a particular character and it’s definitely interesting! I’ve had an opportunity to use it and it was very useful. I fully intend on using it on a fiend team and I recommend that everyone try using it just to see how it works. Of course, you only have a 50/50 chance for it to work each time you try to Gate something in, but totally worth it. I used Erinyes, Lesser Fiend on my draft team and was even able to Gate another in. I fielded my first Erinyes, then used Gate and rolled my second Erinyes from the card. It rolled a character face, so I got to put it into my Prep Area for next turn. Had it rolled energy, it would have been returned to the card and I wouldn’t have lost anything.